Basically: It’s so good to be back On My Block. 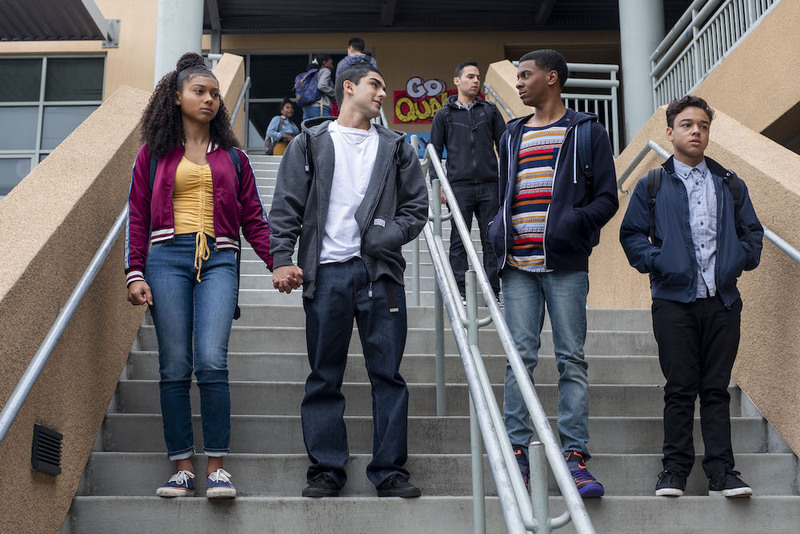 Is it possible that On My Block leveled up for Season 2? Yeah it is. And we’re loving it hard. Not many shows give us the joys mixed in with the 808s & heartbreaks of living in the hood. At least not without dissolving into melodrama or clichés of violent misery. John Singleton did it with Poetic Justice. So did F. Gary Gray for Friday. Patricia Cardoso did it in Real Women Have Curves, and now On My Block creators Lauren Iungerich, Eddie Gonzalez & Jeremy Haft have proven they can too. Many thanks, Lauren, Eddie, and Jeremy. Stick around, I have requests. Back to the show: Last season ended in shots fired and we weren’t sure if Ruby (Jason Genao), Olivia (Ronni Hawk), or Cesar (Diego Tinoco) would survive. Netflix relieved some of our anxiety when they released the cold open for season 2 [watch below]. It’s a good thing they did too because I wasn’t going to tell you. I want you to enjoy OMB S2, episode by episode, the way I did. Also, the music, the friendship, the money, the grief… It all goes deep into our feelings. The Freeridge Gang of Goonies continues their ‘what the hell’ hijinks but, this season, rather than a mysterious treasure hunt they slip, slide, and trip into a hilarious world of crime. And the mistakes from their individual pasts keep coming back to taunt them. Meanwhile, on the serious side, Cesar has nowhere to go, Ruby has PTSD, Monse (Sierra Capri) is in the middle of an identity crisis, and Jamal (Brett Gray) keeps melting down—that’s his job, he’s good at it. These humorous highs and lugubrious (that means sad) lows push our characters to grow. The writers do this so well, there’s nothing repetitive about the things the Freeridge Goonies go through and because of that they feel very real. As do their relationships with each other, which are stretched near to breaking but always find unexpected ways to snap back. As a bonus, Jasmin (Jessica Marie Garcia) has full Goonie credentials this season and we couldn’t love her more if we tried—this girl has depth. The relationships between the kids are just one part of the pull of OMB. The show also celebrates family to a greater degree this season and black fatherhood gets a much deserved shoutout. An ovation for Monty (Reggie Austin) and Dwayne (Eme Ikwuakor). We needed to see fathers like them on screen to reflect the real life versions of them who seldom get their shine. Brotherhood is another high of S2, with several pairs of hermanos: Cesar and Spooky (Julio Macias), Ruby and Mario (Danny Ramirez), and weirdly but effectively Jamal and Cesar, and Spooky and Ruby. They expand their bonds and give us the giggles while they do it. The mamas have always been amazing on OMB. Geny (Paula Garcés), mother of Ruby, could be a one-woman show. She absolutely loses it (she was provoked). Of course the great queen Abuelita (Peggy Blow) is #legend. Give this woman an Emmy. Which brings me to my second request: They’re aren’t a lot of black women for Monse to bond with and explore that side of her heritage. Hey creators, can we get some #blackgirlmagic, please. Jamal’s mom (Raushanah Simmons) would make a great auntie and mother figure in Monse’s life. Now that I’m done being a stan, at this point in the review, the possibilities for spoilers are a minefield. 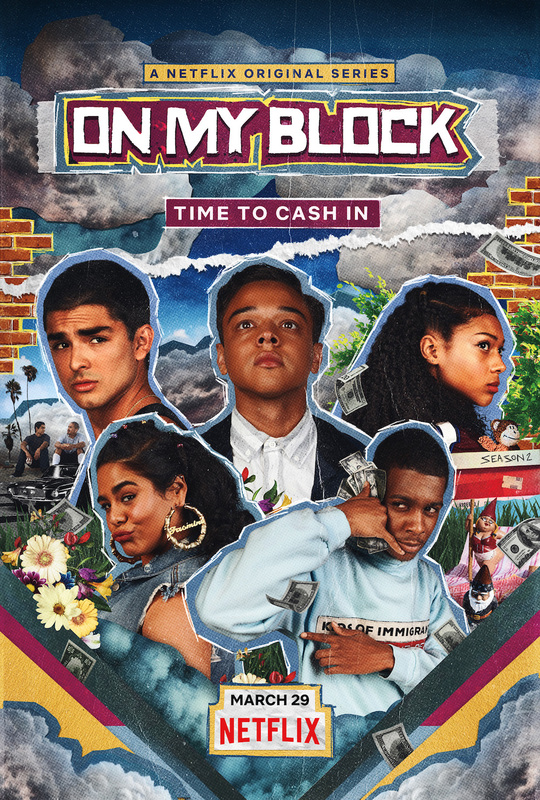 Let’s wrap this up by saying: If you didn’t like it before you’ll be into it now, and if you already love On My Block it’s about to become an obsession. Oh yeah, and watch out for the cliffhanger, it’s a helluva fall. In the End: We’re ready to throw an (On My) Block Party! On My Block season 2 hits Netflix on Friday.